On the Cover: Pluto is not just a puny ball of ice and rock with a crazy orbit on the fringes of our solar system; it is a dynamic world undergoing dramatic surface and atmospheric changes. 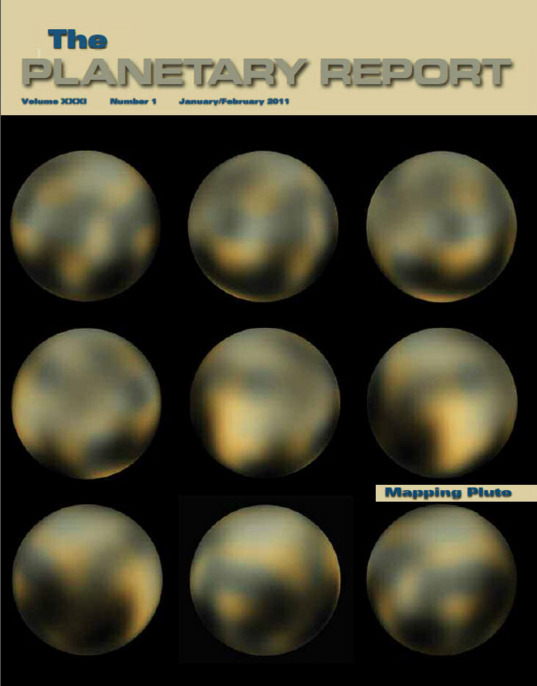 These recent Hubble Space Telescope (HST) maps of Pluto, shown in a rotational order spaced 40 degrees of longitude apart, reveal marked differences from observations made in the early 1990s, when HST was new on the job. These invaluable maps will help scientists not only in interpreting more than 30 years of Pluto observations from other telescopes but also in picking out the best features on which to train New Horizons' cameras when it flies by the dwarf planet in 2015. 4 Snapshots from Space: The Giant's Baleful Eye: Emily Stewart Lakdawalla zooms in on Jupiter's Great Red Shot. 5 Your Place in Space: Here and Now: Our Unique Perspective: Bill Nye wants us to change the world. 6 Zooming in on Pluto: Using the Hubble Space Telescope to Map a Faraway World Marc W. Buie looks at mapping this tiny world. 12 Change Comes From Within Jim Bell reflects on changes in NASA, the Planetary Society, and his own life. 15 LightSail Update: Testing, Learning, and Waiting: Louis D. Friedman gives an update on this exiciting Planetary Society project. 18 We Make it Happen! Fun with Microrovers: Bruce Betts talks about the benefits of these small but mighty machines.